Some dude over at Rebelshit is reporting that the new issue of Lee's has a pic of Wave 1, which includes the brand-new, never-before-seen German Soldier figure. Haven't seen any scans yet. . . Missing from this are Sallah and Monkey Man. Neat German Soldier there though... He looks as though he'll fit in decently with the latest DAK figures 21st made. Could mix/match for some variety easily. German soldiers didn't wear Jackboots in the Desert...but they did in the movies so, no complaints. 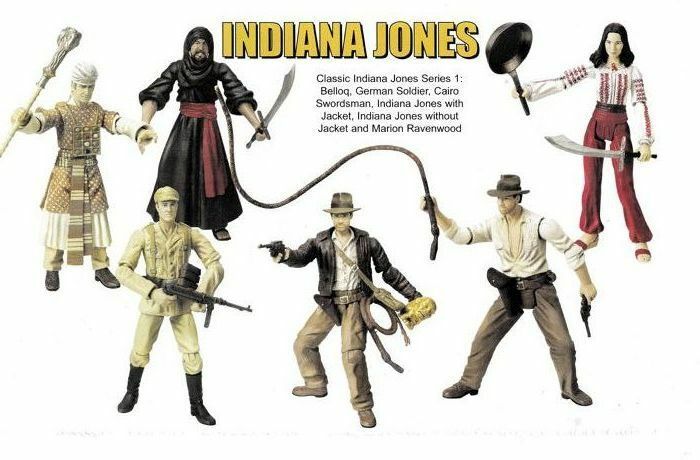 I can see this line becoming a Top 3 in my collecting, especially since the head sculpts seem to "mesh" with Joe and SW.
Is it me, or does the jacket-less Indiana's whip look like it's made of soft plasttic over bendable wire? Would that be crazy, or what? I love how easily you can ruin a figure for me Paul. I still dig him... I'll BS the jackboot thing and just mesh them in with my DAK figures from 21st. I think they'll blend quite nicely. Not to mention the possibility of swapping parts too, as the 21st DAK all have laced leggings on over their boots anyway. And hey, who's to say somewhere, somehow, jackboots didn't slip in on accident. Maybe in the German's elite groups sent to find ancient relics even? Hey, ya never know. I can't tell from the pictures but it doesnt look like the hats are removable so i would add one traditional one with jacket and removable hat. I am also willing to bet that if these sell well we get a vintage collection version. That is a really good question...How could the Indy Hats NOT be removable? And wasn't one of these Indy's suppossed to have an...ugh I hate to say it..ACTION FEATURE? Their reason for no removable fedora is it's a choking hazard. If these continue to comes in waves of 6 or so, that would be fine with me. A little bit easier to keep up on things anyways . Thanks for that link Brian! These look better each time I see them... wow the German officer looks like a fantastic figure! I wish that Marian and both Indy figures had articulated knees though. and both Indy figures had articulated knees though. Actually, that first Indy (With the Jacket & Idol) looks like he has ball jointed knees. Indy with Jacket is the super articulated Indy we saw at SDCC. Indy without the jacket is the action-feature (whipping) Indy we also saw at SDCC. The German's actually a regular soldier, not an officer. I forget the chap's name that was the officer now off-hand, but he's pretty uniquely uniformed compared to the regular DAK soldiers there. I'm hoping we see him made of course because, well, he was one of the 3 main baddies with Toht and Belloq. Wow this wave looks awsome. Definatly buying them all with a few extra Germans for both Indy display and possible "rebel troopers"